Clients of any age or fitness level can perform these beneficial moves. Imagine a free, natural medicine that is as healthy for you as pristine mountain air and organic food. Further imagine that this medicine is reputed to strengthen your immune system, prolong your life span, increase your energy, uplift your spirit, vitalize your sexual functioning, enhance your general health, relax your body and calm your mind. Does this sound like another far-fetched health claim? Well, for thousands of years, millions of Chinese have highly valued this “medicine,” known as qi (or chi, pronounced chee), which can be activated through the practice of qigong. 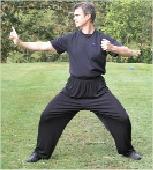 There are many forms and systems of qigong practice. Following is a review of “The Eight Pieces of Brocade,” a classical form of qigong that is highly regarded for its health-promoting benefits. As I tell my students (and remind myself), always remember to breathe, relax and enjoy the present moment when practicing these movements! Practice Guidelines. Relax deeply while standing with your feet firmly rooted to the floor, knees slightly bent. Breathe using slow, continuous breaths. Place your tongue lightly at the roof of your mouth, behind your teeth. Move your body with the lightest of effort, as if you were “swimming in air.” Let go of distractions and attentively focus the mind on each movement of the body. With practice, over time, you can naturally coordinate your breath with the exercises by exhaling during expanding movements and inhaling during contracting movements. Repeat each individual “piece of brocade” eight times to achieve the greatest benefit. According to Chinese tradition, this “piece” helps to regulate and enhance the functioning of the “triple energizer,” which consists of the heart and lungs, the stomach and spleen, and the liver and kidneys. This move also lowers heart rate and blood pressure; improves circulation; and relaxes the muscles. The Movement: Stand with legs shoulder width apart, palms facing your legs. Raise your palms, facing upward, as you inhale. When you reach the level of your heart, face palms outward and begin to exhale while gently pushing your hands up. Slowly lower your hands as you inhale, switching to exhalation as you reach the level of your heart. Complete the piece by returning your hands to your sides during exhalation. According to tradition, this piece opens the “lung channel” and helps to regulate and improve kidney function. This move also strengthens the legs, knees, abdominals and back muscles; increases mobility in the shoulders and neck; conditions the arms; relaxes the muscles; and offers a mild benefit to the heart. The Movement: With a deeper bend in the knees, take a stance approximately 11/2–2 times the width of your shoulders. Inhale as you cross your arms, and then exhale as you “pull the bow to shoot the arrow.” Switch position by turning in the opposite direction while inhaling, crossing your arms again before executing the movement. The rear hand is lightly closed. The index finger and thumb of the front hand are extended, with the three remaining fingers closed into the palm. Complete the piece by inhaling as you cross your arms and raise your body up, then exhaling as you return your arms to your sides. According to tradition, this piece helps to regulate and improve the functioning of the stomach and spleen. It also conditions and lengthens the arm, shoulder, back and abdominal muscles; improves circulation; and offers a mild benefit to the heart. The Movement: Stand with feet shoulder width apart, arms by your sides, palms facing your legs. Inhale as you cross your arms in front of your chest. Exhale as you raise one arm up and lower the other arm down, maintaining curvature in the arms. Switch arm positions by inhaling as you bring both arms together to cross again in front of your chest and then exhaling as you move the arms into the opposite configuration. Complete the piece by crossing the arms once again during inhalation before lowering them by your sides as you exhale. According to tradition, this piece helps to regulate and improve the functioning of two major energy reservoirs within the body, the “conception vessel” (front of body) and the “governing vessel” (back of body). This move also increases mobility of the neck; lengthens the spine; and relaxes the muscles. The Movement: Begin with feet shoulder width apart, arms at your sides, palms facing your legs. Inhale as you raise your palms facing upward while bending your knees. Then exhale as you push your hands downward, straightening your legs while extending your spine. At the top of your spinal extension, “fan” your hands at your sides with fingers pointing away from your legs and look behind one shoulder for several seconds. Inhale as you move to repeat this sequence, ending by looking over the opposite shoulder. Complete the piece by turning your head to the front while inhaling as your palms face upward in front of your abdomen, and then exhaling as your arms return to your sides. According to tradition, this piece benefits the heart by exercising the lungs and activating the energy of the kidneys, thereby extinguishing the “heart fire” (e.g., worry, anxiety, distress, heartburn). This move also strengthens and conditions the legs, knees and low back; enhances mobility of the spine; and strengthens and lengthens the hip, abdominal and low-back muscles. The Movement: With a deeper bend in the knees, take a stance approximately 11/2–2 times the width of your shoulders, hands resting on your thighs. Inhale while upright, and then exhale as you sway your body to the right in a diagonal side motion, aligning the tip of your nose (along the diagonal) with your left big toe. Inhale as you move in the opposite direction, switching to exhalation as you cross your center and sway your body to the left in a diagonal side motion, aligning your nose with your right big toe. Complete this piece by coming to center as you inhale, raising your body up, and exhaling while returning hands to your side. According to tradition, this piece improves kidney function. It also lengthens and strengthens the low-back muscles; strengthens the abdominals; and lengthens the hamstrings. The Movement: Take a stance approximately 11/2–2 times the width of your shoulders, and frame your navel with your fingers, thumbs touching above the navel and index fingers touching below it. As you inhale, trace your hands around your waist to your low-back/kidney area. If appropriate for your back, you may do a slight back bend while completing your inhalation. As you exhale, begin a forward bend while moving your hands from your low back to trace the backs of your legs, ultimately bringing your hands to rest on the tops of your feet for 3 seconds. Begin to inhale as you trace the insides of your legs all the way back up till your fingers are once again framing your navel, and then start the next cycle. Complete the piece by lowering your hands to your sides as you exhale. According to tradition, this piece lifts one’s vitality, enhances the power stored in the lower abdominal area and improves the functioning of the liver, ridding it of the effects of excessive anger and hostility. This move also strengthens the legs and increases energy. The Movement: With a deeper bend in the knees, take a stance approximately 11/2–2 times the width of your shoulders, with hands formed into lightly clenched upright fists by your sides. Your eyes maintain an angry, fiery glare: the “fierce eyes of a tiger.” Inhale, and then exhale as you slowly punch with your left hand, spiraling your fist in front of your body with the clenched palm facing downward. At the completion of the punch, begin to inhale as you withdraw your left hand back to your side (clenched palm now facing upward) before you exhale while punching out with your right hand. Complete the piece by inhaling as you raise your body up, exhaling as you lower your hands to your sides. According to tradition, this piece stimulates the immune system and rids the body of stress and illness. The move also strengthens the calf muscles; conditions the feet, ankles and Achilles tendons; promotes mental clarity; and increases energy. The Movement: Heels are close to one another, with feet in a “V” formation. Inhale as you raise your palms, facing upward, while bending your knees. Then exhale as you push your hands downward and straighten your legs, moving onto the tips of your toes for 3 seconds. Conclude your exhalation as you let your relaxed body bounce naturally on your heels, allowing it to yield to the effects of gravity, like a raggedy doll, without trying to make the movement happen. Do this seven times. On the eighth repetition, with feet flat on the ground, purposely shake your entire body eight times, flexing your knees up and down while flinging your arms downward. This movement is known to put a smile on one’s face! Chuen, Master Lam Kam. 1991. The Way of Energy: Mastering the Chinese Art of Internal Strength with Chi Kung Exercise. New York: Simon & Schuster. Cohen, Kenneth S. 1997. The Way of Qigong: The Art and Science of Chinese Energy Healing. New York: Ballantine. Jahnke, Roger. 2002. The Healing Promise of Qi: Creating Extraordinary Wellness Through Qigong and Tai Chi. New York: Contemporary Books. Yang, Dr. Jwing-Ming. 1997. Eight Simple Qigong Exercises for Health: The Eight Pieces of Brocade. YMAA Publication Center. Yang, Dr. Jwing-Ming. 1997. The Root of Chinese Chi Kung: Secrets of Health, Longevity & Enlightenment. YMAA Publication Center. Cammarata, Larry. 2008. Eight Mindful Movements of Qigong. www.ideafit.com/fitness-products/sessions-from-2008-inner-idea-conference. Tsao, Master Jesse. 2005. Qigong Essentials: Eight Piece Brocades. www.taichihealthways.com. Want more from Larry Cammarata? 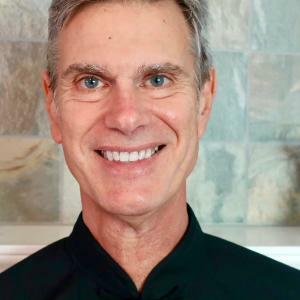 Larry Cammarata, PhD, is a licensed psychologist, mindfulness educator, and instructor of Tai Chi & Qigong who can be contacted at www.Mind-BodyWellness.org and www.MindfulnessTravels.com.